Bright and early this morning found Jerry, Education Bob and myself headed up to the big bad city to claim my latest project. (Merci vous CMM...the pick-up was perfect). 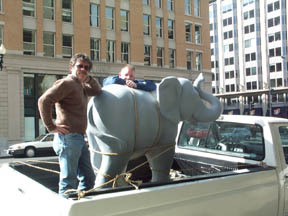 Melissa, whom Bob and I share an office with decided to name the elephant. She chose �Fatty�. Well, it�s been modified a bit��Phat Daddy�. So, as I was saying, the three of us headed up on this very cold morning to bring Phat Daddy back to the grey garage (my studio). Our destination was the old Woodies Building. I was given a choice of taking one home or working there. Other than the long drive and parking expenses, I would have liked to worked there. The entire second floor is covered with donkeys and elephants. The room has large windows and is just very surreal. 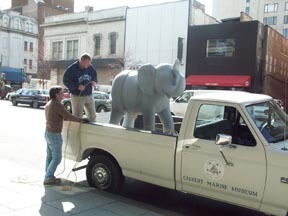 Bob and Jerry loaded him into the back of the truck while those passing by did double takes and stopped to watch. What? 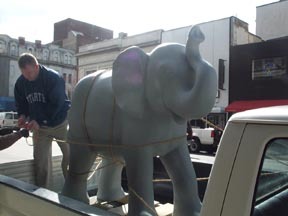 Never seen a large grey elephant before? Once it was roped in, we proceeded back to Southern Maryland, safe and sound.